Perhaps surprisingly given that we’ve been deluged with guests for the last month, we haven’t actually cooked for them much, or at least, cooked anything we’d dare post. As anyone who’s been a host knows, having guests is an exhausting experience, but especially so when you’re playing the role of tour guide too, so here are two simple side dishes instead of something that required more lengthy preparation. We ate them with some enormously meaty lamb rib chops and a fat lump of hanger steak that had both been rubbed with a chipotle-cumin-Mexican oregano mix. A hearty red Zinfandel accompanied it all fearlessly. Drain potatoes and while still hot, return to pot with onions, oil, cilantro and cheese. Toast pumpkin seeds in a dry pan until lightly browned, but no more. Reserve. Combine ingredients well and serve on the side of plenty of red meat. love the cotija and potatoes. makes me think…. I love the cotija cheese addition. That is one of my favorite cheeses and I bet it went great with the potatoes. 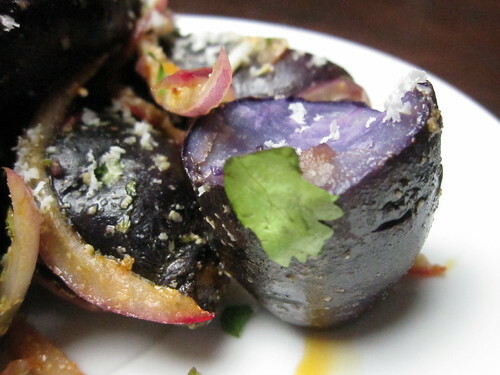 I love purple potatoes because they’re always so pretty. And with cotija? YES! This is such a special meal. 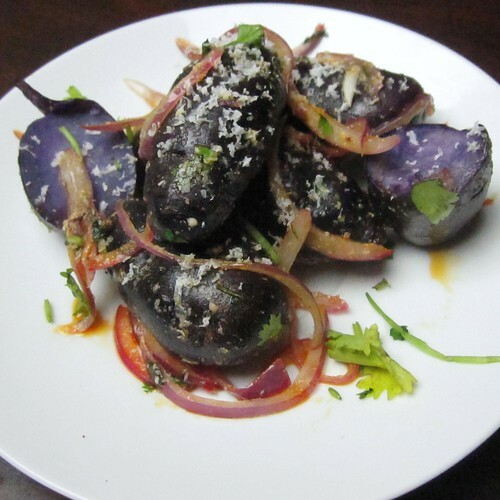 I like those purple potatoes. I love finishing touches and cilantro and pepitas are two of my favorites. Gives everything a little bit of a Latin twist. thoses pattypan squashes are just fantastic, like little alien spaceships…..
Hope all is well and good in your new place – vast I hope. Hmmm. Vast wouldn’t be the word I would use. But compared to the other place it is! Delightful combination of exciting vegetables and excellent colour choice ! Stunning pictures Chicos! With side dishes like this, who wants a first or a second? Absolutely delicious :D. Ain’t purple potatoes cool? I love them!!! Miamm, what a delicious meal. Very colorful s well. 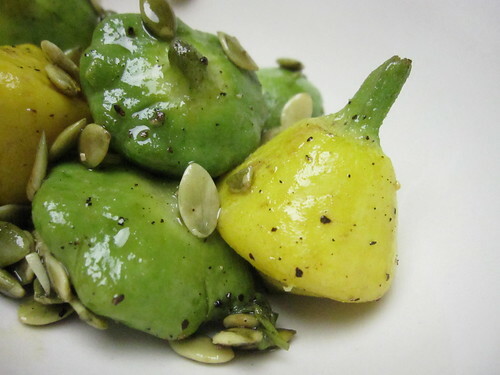 Pattypan squash – I have never heard of nor seen these adorable little guys. They made me laugh! 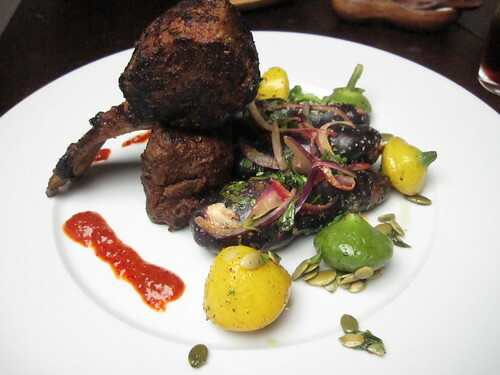 And Zin is definitely the go-to wine for zesty food. Cool close-up shot of the purple spuds – I had no idea what they were and couldn’t wait to read your post to find out! What a colorful plate. 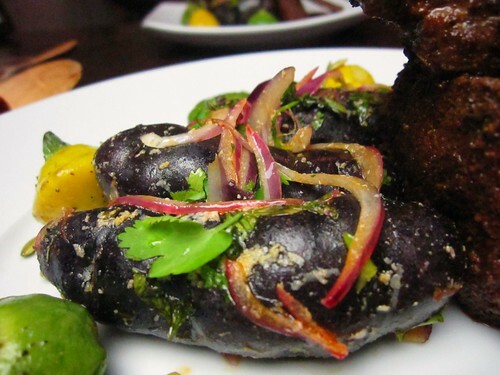 Where these those “Russian Blue” potatoes or the Asian purple yams? Hey marc! They were the russian blue potatoes. i’d love to get my hands on some of those asian purple yams… they are even more gorgeous than the russian ones! Great interesting combinations! I’m really liking the pepitas with squash. ← What do Thomas Jefferson, Harlem Jazz Musicians and the PA Dutch Have in Common? Chicken and Waffles, Baby!